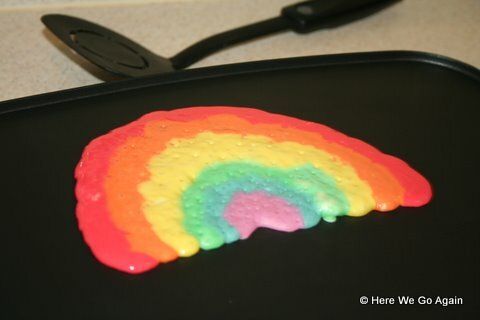 Do your pancakes look like rainbows? 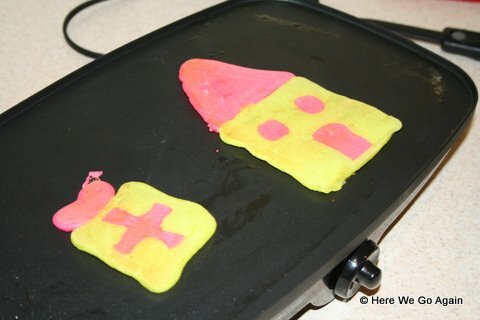 Inspired by pictures of pretty pancakes I saw on the internet, I’ve started making fancy pancakes for the Dibits.Â Here is how to make fancy pancakes. First, make a batch of pancake mix.Â (I’ve been mass producing the dry mix, bagging it, and then I just need to add an egg, some oil, and some milk in the morning. 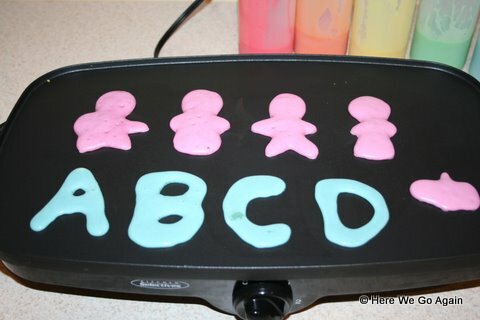 )Â Separate the pancake batter into separate bowls, one for each color. 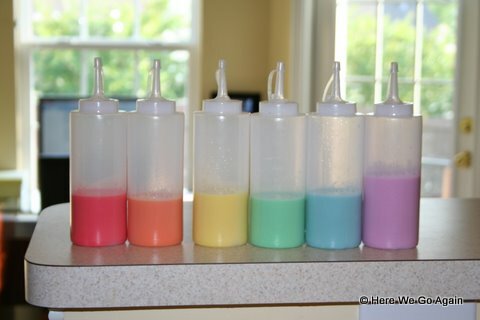 Pour your colored pancake batter into bottles.Â I got these condiment bottles at Walmart for about $.87 each.Â I also use a funnel to easily get the batter into the bottles. 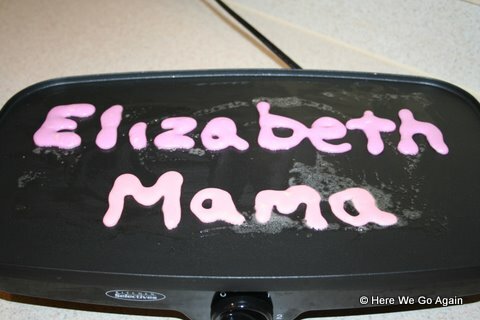 Then you can use the spouts of the condiment bottles to draw your pancakes.Â I use an electric griddle that we bought on clearance one year, but a pan would work as well.Â I like the griddle because it gives me a nice large, flat surface to work on. 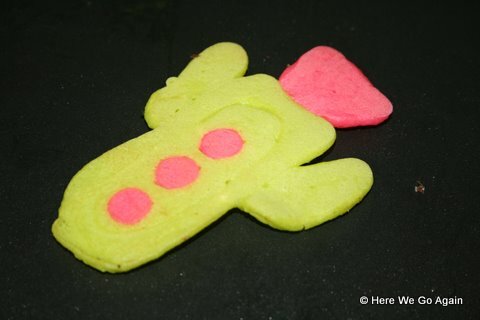 Then you are only limited by your imagination!Â Here, I made a rocketship pancake. 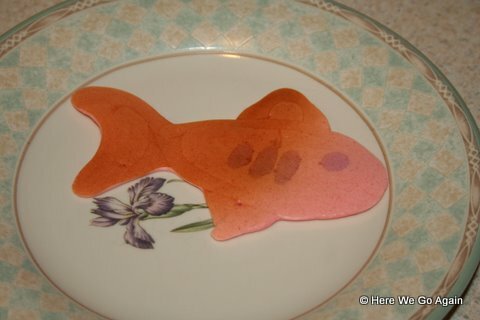 We made a shark pancake. 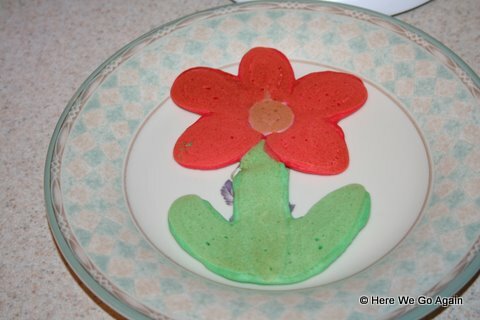 Elizabeth’s favorite pancakes, however, are these little stick figure, gingerbread man looking pancakes.Â She asks me for “a blue Mr. Incredible” or a “purple Tinkerbell” and this is what she accepts.Â (I am not that great at drawing actual people in pancake form. 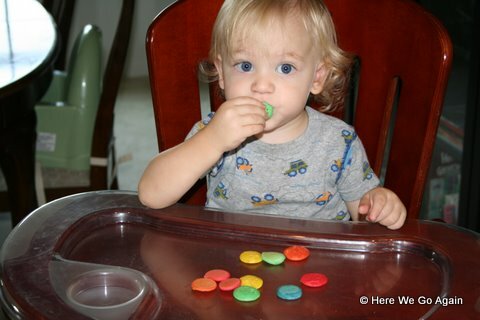 )Â This one is the whole Incredible family, including baby Jack Jack.Â And some letters, since we are working on the alphabet (very casually though). 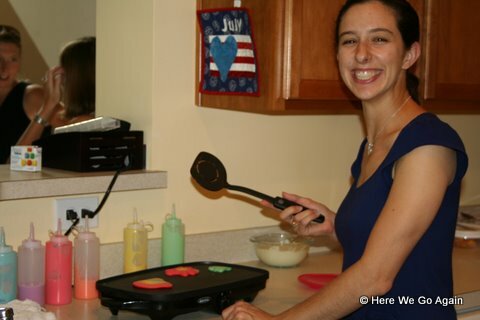 One really handy thing is that since we don’t use up all the pancake batter in one morning, I can just put the condiment bottles right into the fridge and they are ready for the next morning.Â I can usually get about three days out of one batch of pancake batter before I have to make more. 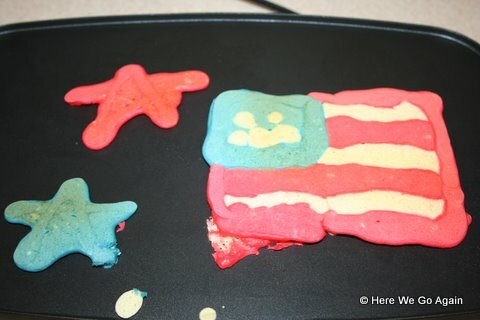 Any great ideas for me to make into pancakes?